When I had my first lesson with Michelle I was very nervous, but she was calming. I did a 30 hour semi intensive course and passed first time with only 2 minors in under two months. The LDC system is very student centred so you should work on what you felt you needed to as well as suggestion from the instructor. I have also recently just completed a motorway lesson with Michelle also. What I think of you: Patient and down to earth instructor who let me learn effectively by allowing me to make mistakes in a controlled environment. Simple communication and focusing on not just passing a test, but teaching important driving skills for the future. What I think of the LD System: Lots of useful resources relating to the initial stages of learning to drive to the intermediate skills and mock examinations, the system of being student led allows you to feel in control of what you are paying for and with the amount of resources available meant I could maximise my contact hours. Michelle was a fantastic instructor for me after struggling to work well with a more traditional instructor in past years. She understood the concerns I had and found ways to work through them with me in a way that never made me feel overwhelmed or scared. She was always encouraging and allowed me to choose what I wanted to work on, whilst also giving me the push I needed if I couldn’t decide what to do and advising me on what might be best. We had great fun and a lot of laughs, she was warm and friendly and I thought she had a great balance between having fun whilst also making sure that we were safe and I was clued up on the lesson at hand. The LDC system was perfect for me as it let me choose what I wanted to learn at what times. I also had the choice of following along with the lessons outlined in the learning book if I wanted to. The learning book was extremely useful for me as I learn best by reading and preparing as opposed to learning as I go. The book allowed me to feel prepared going into each lesson as Michelle always coordinated and discussed with me what I wanted to do next time, giving me time to study up by watching or reading LDC’s guidelines. I benefited greatly from this as I found that with my previous instructor I never felt prepared, with them deciding what we were to learn which would make me extremely anxious. Michelle on the other hand put me in control and encouraged me to make the decisions about how my lessons would go. I also found the feedback after every lesson extremely valuable and reassuring. Instead of just being told where I went wrong I was encouraged to reflect on the lesson and see what areas I could improve on. I was encouraged to explain and work through how I would make these improvements instead of just being told, which made me feel much more confident in my ability. 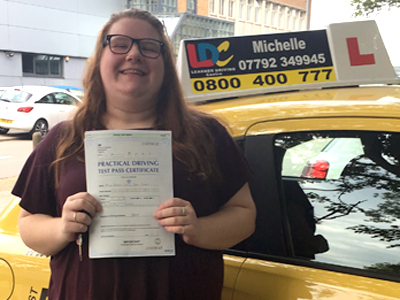 Michelle always made me aware if she needed to take control of the car for any reason, something that my previous instructor didn’t do which caused a lot of my anxiety around starting lessons again. Michelle put me at ease from the first lesson and her up to date knowledge, and the detailed learning book and videos provided, helped me immensely. I would highly recommend Michelle and the LDC system to all learners, especially those that are nervous about getting behind the wheel for the first time! 5 star Michelle was a brilliant driving instructor and helped me passed first time! She taught me to pass the test but more importantly how to be a safe driver for life, offering plenty of tips and tricks throughout. Michelle also had a great sense of humour which kept me calm and aided me in getting my confidence on the road. I couldn’t have asked for a better instructor than Michelle and I would definitely recommend! Michelle is a very calm with a student centred approach she put me at ease from day one. Before I started with Michelle I wanted to do automatic just because it was the easiest option but she made learning in a manual really easy and lessons with her were always enjoyable. 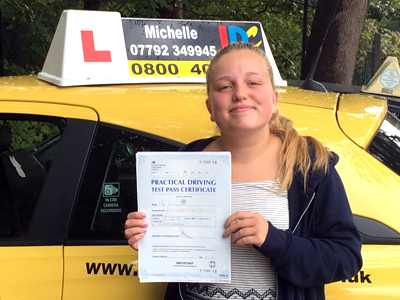 Michelle's teaching skills along with the LDC method are what helped me pass my first time with only 6 minors. I couldn't recommend her enough to anyone wanting to learn to drive I can honesty say you won't be disappointed. Michelle is by far the best instructor I have ever had. She took me from being full of doubt after a long break from learning and saw me though to a speedy Pass. She made me feel relaxed, and made every lesson enjoyable while targeting the areas I felt I needed extra attention.her knowledge is sharp and her customer service superb. She invest in top quality equipment such as the latest Satnavs used by the examiners. If you want great instructor who is calm, patient,and reliable, look not further than Michelle.